For work and pleasure, I traveled every week between the first week of February and the last week of May. After I stayed home for three weeks with regular periods of sleep and fewer work demands, my chronic fatigue was reduced. Chronic fatigue can be caused by lack of sleep, stress, and irregular schedules. Shiftworkers are susceptible to chronic fatigue, and the only cure is two or three periods of uninterrupted, nighttime sleep of sufficient quantity and good quality. A few weeks ago, our air conditioner was not working. It took a couple of days to get it repaired. Although I tried to sleep in the bedroom at first and then on the porch, there was one night when I did not sleep at all. It was just too hot. Because I was awake for about 36 hours, I experienced acute fatigue. After I slept one night in a cool room for 12 hours and later took a nap, the effects of the acute fatigue were gone. One can experience time on task fatigue due to prolonged periods of physical and/or mental exertion. In control rooms, a person who has to concentrate on a task or a series of consecutive tasks in a short amount of time or for an extended time may become mentally tired. This can lead to performance issues, stress, and errors. A controller should plan the work, if possible, in order to take breaks from the console. In a few forward thinking organizations, a shift is staffed with extra controllers so that all personnel have opportunities for breaks during a shift. 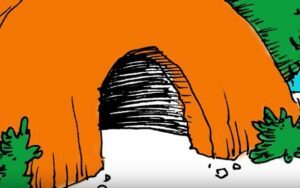 Cumulative fatigue is defined in several ways. The simplest definition is repeated mild sleep restriction or extended periods awake over several days. I think it is more complicated than simple. 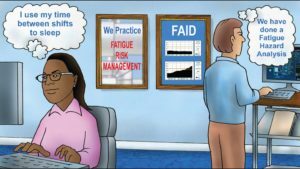 Fatigue can accumulate over an entire career of working rotating shifts if a person is not able to get enough sleep between shifts and sets of shifts. When I worked backward rotating shifts with regular overtime shifts for 16 years, I was always tired. Using my off-duty time for activities beside sleep and a long commute exacerbated the effects of shiftwork. Circadian fatigue occurs during those periods of the 24-hour day when our circadian rhythm is at its lowest, particularly between 0200 and 0600. There is a natural desire for sleep even if we have important responsibilities for pipeline safety. During windows of circadian lows, it is important to use fatigue countermeasures. 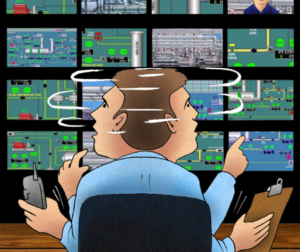 Passive fatigue can occur during monotonous tasks, such as monitoring SCADA displays. If the work duties do not require more stimulating tasks, a person may experience boredom, lapses in attention, slow reactions, and microsleeps. Passive fatigue is also common when driving vehicles. 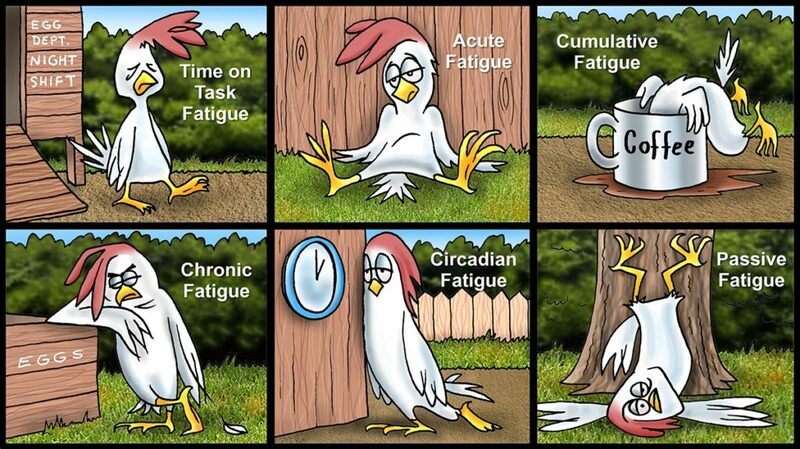 You may be wondering, looking at the drawing, if chickens experience the same types of fatigue as people. I don’t think so; we just think chickens make neat illustrations of the concepts. Chickens sleep when fatigued, take naps, experience REM sleep, and do not work rotating shifts. One difference is that chickens have the ability to sleep with one eye open and the other closed. Because of the ways their brain is divided into two hemispheres, they can be asleep and awake at the same time. I think another difference is that chickens know their limits and humans do not. People who work rotating shifts can experience time on task, chronic, acute, cumulative, circadian, and passive fatigue. I believe we already know that the only ways to address all types of fatigue include sleep, rest, regular mental and physical breaks, use of fatigue countermeasure, and interesting pastimes that provide necessary stimulation. If we continuously push our limits, the consequences can be harmful to our personal health and detrimental in the performance of our work.